Google has announced the most impactful change we have seen in a while; the first wave of mobile-first indexing. Google has not yet issued an official date for when all websites will be indexed with the mobile-first algorithm, however, it's important to optimise your website now to avoid suffering a drop in Google's search rankings. Since Google started in 1998, websites have always been crawled using the desktop version of any site. However, now that the majority of users search on Google using a mobile device, Google has embraced the change and is ensuring mobile users will get the best experience. Back in 2015, Google started to favour mobile-friendly websites, this means that your website should be responsive and therefore adapts to become easier to use on mobile. For instance, there should be; no horizontal scrolling, no need to zoom in to be able to read text, the menu should be usable on mobile (most websites swap to a 'burger menu' to comply with this) and the full website should be tested to ensure everything works as it should on the smaller screen. 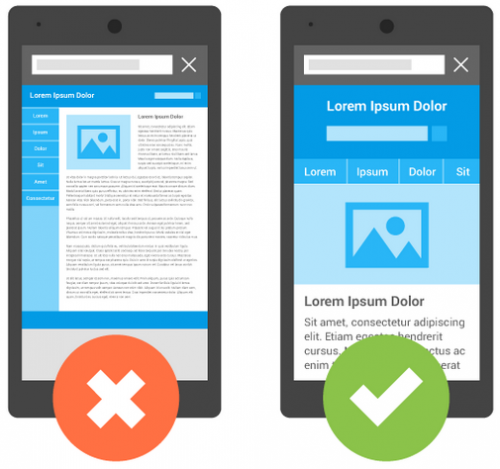 Google had made this change to ensure anyone using mobile to search would only be taken to a mobile-friendly website, and any websites that are not mobile-friendly would be de-ranked on the mobile search engine. Stepping forward to now, Google's latest algorithm change will ensure that websites currently using the best practices for mobile-first indexing will be favoured in both mobile and desktop search results, and if you have a mobile-only version of your website, then Google will prefer the mobile URL for indexing. Try out Google's dedicated mobile-friendly test, here. What do I do if my website isn't mobile-friendly? Get in contact with the Brace team today to see how we can help! We can design fantastic responsive websites which look great no matter what device they are viewed on.